How is the Heat Output of a Propane Heater Rated? If you've ever tried working in your garage or workshop and it was so cold you did more shivering than repairing, then you'll want to read on. We are going to show you how you can turn your cold and unwelcoming garage, into a warm and comfortable place for you to work. The way it can be done is by heating your garage with a top propane garage heater, but choosing the right one can be difficult, especially if you've never owned one before. To help you, we are going to outline the main features that the best propane garage heaters have and review the top 5, so that you have all the information you need to make the right choice. This is a small and lightweight propane garage heater that is designed to attach to the metal rim on the top of a propane gas tank. You simply use the clamp, which is provided and secure it to the rim, and once you have secured the gas connector you are ready to light it. Unfortunately, this heater does not have the electronic ignition that other top propane garage heaters have, so you are going to have to use the naked flame from a match or lighter. The heater is suitable for different propane tank sizes ranging from 20 lbs. up to the larger 100 lbs. tanks. On average you should expect to get around 14 hours of heating time from a 20 lb. tank. In terms of the amount of heat this little heater can produce, it should be able to reach around 40,000 BTUs, which should be enough to heat an area of up to 1000 square feet. The design of the heating unit is such that it radiates heat 360° around its entire circumference to produce heat evenly across your garage. You can adjust the heat level, but there are only 3 settings, so your options are fairly limited in terms of having it at different temperatures. If for any reason the heater and propane tank get knocked over, a safety device will activate and switch it off. This prevents the heater continuing to operate and potentially burning or setting alight anything combustible that it may have landed on. This propane gas heater is one which blows out a very powerful stream of hot air, with the added benefit that you can direct it to where the heat is needed most. That will most likely be the spot where you are working in your garage, but it can also be used to thaw frozen water lines and ice from your car windscreen. Of all the products we are reviewing this is the best propane garage heater in terms of heat output with it reaching up to 125,000 BTUs. This is one of the highest ratings you find with this type of propane garage heater, and as such, it can be used to heat larger areas of up to 3,100 square feet. The gas hose and connector are supplied and once you have connected it to the propane tank and plugged the electric cord into the power socket, you can start the heater. There's no need for matches or a lighter, as this heater has electronic ignition. Simply press the button, and release it, once the flame is lit. You might hear the ignition continue to click, which can be annoying, but this is to provide instant reignition if the flame goes out. Once you have started he heater, you can use its very sturdy carry handle to move it and place it in the area you want it to blow the warm air. You can adjust its height up or down so that it is pointing toward the exact spot you want it to. If you are getting too hot, you can turn the heat level down, using the adjustment dial on the side. Obviously, you can also turn it back up to a higher setting too, if you need more warmth. This is another propane heater which expels hot air with a fan to heat your garage, workshop, or outhouse as quickly as possible. One issue which this heater addresses is that of noisy fans, given that it is around 50% quieter than standard propane heater fans. It has electronic ignition, so you don't have the bother of finding matches or a lighter. Once the heater is running the ignition is continuous, which prevents the possibility of the flame going out. It weighs just 13 lbs. so it is light enough to be moved and carried by its carry handle to whatever part of your garage you are working in. Once you have got it positioned, you can also alter its height to pinpoint its flow to exactly where you are, so that you get the most benefit from the hot air coming from it. If you set that heat to maximum using the adjustment dial, it can produce up to 60,000 BTUs, which is ideal if the temperature outside is low and you want to heat your garage up quickly. An important safety measure is the overheating sensor which prevents the heater from exceeding safe temperature limits. Should you feel it is getting too hot the heat level can be adjusted downwards, and when it is set to 'Low', at that level a full 20 lb. propane tank should last for up to 14 hours. One of the biggest benefits of forced air propane garage heaters is that they can be moved around so that the air flow is directed to where you need it most. Obviously, the less they weigh, the easier that moving them is going to be, so with this heater only weighing 11.2 lbs., it should be one of the most portable heaters we have reviewed. Once you have it in place, you can ensure that the air will flow towards you, or whoever is needing the heat the most, by adjusting the vertical angle at which the unit is sitting. To get the heater started you connect it to the propane tank using the hose and connector which come with it. Once you have the electric cable plugged into a socket, you can then light the heater, using the electronic ignition. The best propane gas heaters can produce up to 60,000 BTUs, and that is exactly what this one is capable of. Of course, you do not have to keep it at maximum all the time, so if you need to lower the temperature levels, you can do so with the heat adjustment dial. To keep users safe, top propane garage heaters all have safety features, and this one is no different. Two of the main ones it has are a flame-out fuel cut off to prevent unignited gas escaping into your garage, and it will shut off should the heater reach its maximum safe temperature. Of all the products in our propane garage heater reviews, this is the one that looks most like a traditional type heater that you might find in an office or at home. It comes with legs, so it can be used as a freestanding heater, or you can use the wall mounting hardware, which is included, if you want to have it in a more permanent location in your garage or workshop. You light this heater using the electronic ignition but unlike the other heaters we have reviewed, the ignition is battery powered by two AA batteries, rather than by an electric power cord. The heat level it can reach is lower than the others at 30,000 BTUs, but unless you have an extremely large garage that should still be enough to heat it to a comfortable temperature on cold days. The heater has an Oxygen Depletion Sensor (ODS), which will switch off the heater if it detects oxygen levels are too low. It will also cut off if the temperature reaches its maximum safe level. To help the heat to circulate there is a fan which blows very quietly. This circulating air produces a convection effect, which gradually heats the surrounding area. This is where you do need an electric socket nearby as the fan is electrically powered, although the heater will continue to produce heat, even if there is a power outage. If you get too hot you can use the thermostat to turn the temperature level down, and then back up again if you need more heat. A radiant heater works on the basis that the heat generated at the source flows from it in waves, and that heat is absorbed by objects near the heater and retained by them. The obvious advantage over other garage heaters is that there is no noisy fan to contend with and it can be used without the need for an electrical source. On the flip side, they do have the disadvantages in that they need to be close to you for you to fully benefit from the heat they are producing, and they are not suitable for heating up a large room or garage. 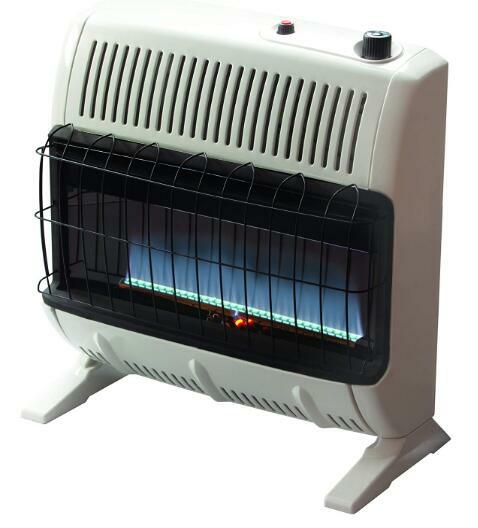 A propane gas convection heater generates heat, which can normally be seen in the form of a blue flame. A small fan then gently blows air across the heat source, and this hot air then circulates into the garage or room to heat it. The levels of heat they can attain are normally lower than the other heater types, but they are more effective at heating the whole room, as opposed to focusing heat in just one area. These work on the same basis as hair dryers but instead of electrical heating elements, the heat is generated by the propane gas and the hot air is then blown in whatever direction it is needed. They're portable, great for directing the heat towards you, and can generate plenty of it, but the fans can be noisy. The unit of measurement for the heat produced by a propane garage heater is a BTU, which stands for British Thermal Unit. It is an internationally recognized unit, although ironically it is more commonly used in the USA as a unit of heat, than it is in Britain. The range of BTUs that the best propane garage heaters can produce, is from 30,000 up to 150,000. Bear in mind that smaller garages can mean that higher BTUs are not required as there is less area to heat. Also, burning a heater at these levels will undoubtedly use more gas. Top propane garage heaters normally have adjustable settings which allow you to set heat levels, which also influences how quickly you deplete the amount of propane gas in the tank. Top propane garage heaters usually come with the appropriate gas connections, so there should be no need for you to go to the hardware store to purchase one. Place the propane tank on the floor of your garage and remove the plastic seal on the gas outlet nozzle. Make sure the heater regulator or heat adjustment dial is at the 'Off' or '0' position. Take the heater inlet connector and place it into the propane tank's outlet fitting. Turn the connector to your left, as unlike bolt threads, gas connections tighten counter-clockwise. When the connector is fully tightened, slowly turn the propane tank's valve counter-clockwise to open it. Listen and smell for any leaks. Propane has an unmistakable 'rotten egg' smell so you should know right away if there is a leak. As a final check use a half and half mix of water and liquid soap and apply it to all the gas joints. If any bubbles form, you have a leak. Obviously, if you have a leak, you should close the tank's valve, and then ensure all joints are properly tightened. Look for any signs of damage, such as cracking in hoses. If you do come across damaged parts, then they should be replaced before attempting to use the heater again. This activates when the temperature sensor of the heater reaches the maximum safe level. This reduces the risk of serious burns to individuals and lowers the risk of nearby materials combusting due to the high temperature. With naked flames and extremely high temperatures being generated, should a propane garage heater get knocked over, there are several dangers. The risk that the flame sets alight whatever it falls onto, and that of someone being burned. To avoid these dangers, the cut off will activate if the heater is tipped over accidentally. Propane heaters can produce tiny amounts of carbon dioxide (CO2), and if CO2 levels get too high, and as they do, oxygen levels fall, it can be very dangerous. To eliminate this risk, an ODS will switch off the heater if it detects that oxygen in the garage or room has fallen below a certain level. Most propane garage heaters have some means of controlling the heat levels, which is normally in the form of a control dial on the side of the heater. Some will have multiple settings which give you a wide range of heat levels you can adjust to. More basic heaters will have 'Low', 'Medium' and 'High' settings. Another adjustment you might be able to make will be the height of the air flow outlet on a forced air heater. Having carefully considered all our best propane garage heater reviews, deciding which one we regard as our winner is a tough choice. 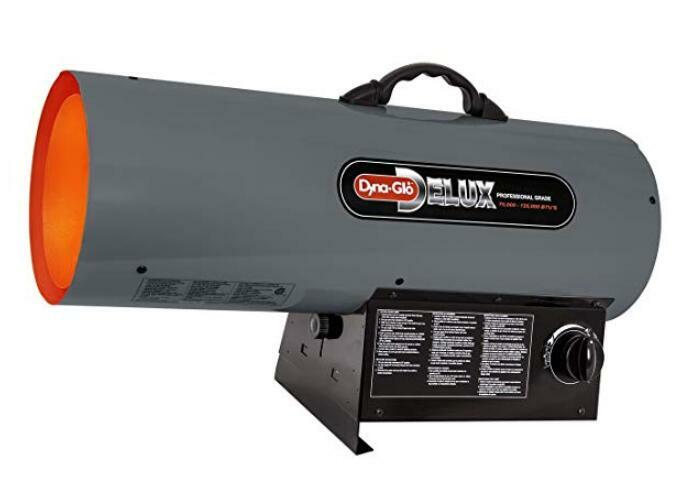 All the heaters we reviewed will produce good levels of heat for your garage, but the one which can really claim to be our 'hottest' garage heater is the Dyna-Glo RMC-FA125DGD Liquid Propane Forced Air Heater, with the ability to produce up to 125,000 BTUs of heat, so it is our top propane garage heater. It has over double the heating capacity of the other heaters we've reviewed, so whether you are trying to heat a single garage or a large workshop it can do so. It matches the other heaters in terms of safety features, and it gives you the ability to adjust both the temperature setting, and its height, so you can direct its heat to where you need it. Electronic ignition to get it started makes it much more appealing than using a naked flame, and its sturdy carry handle allows you to move it with ease. I am looking for an in ground LP thank for a n individual private home and two space heaters to cover an area that is 45x35x10 feet high. Also I would like a instant hot water heater.